In 2002, we gathered a group of fantastically gifted musicians and proposed an experiment. What would happen if we picked a very simple chord progression. And waited on the Lord. We thought it was a little nutty, but worth trying, so we did it. Two days in a row. And recorded it live. A beautiful journey and a delightful conversation with the God who rejoices over us with singing. Its taken us ten years to get around to doing it, but we’re finally releasing the first of the two We Wait albums. All profits from album sales will go towards Jill’s ministry trip to Uganda next month. So we’re not selling it for a set amount. Just make a donation here and we’ll send you a link where you can download the album. Or track us down and we’ll sell you a hard copy version. Watch facebook over the next week for some mp3 “teasers” so you can hear little bits! Last night I was at the Freeway Church at a Kony Public Conversation event, and listened with interest as Ugandans shared their perspectives on the media storm and it’s actual impact and effectiveness on the complex issues around the abuse of power and the use of child soldiers in Africa. I’ve been fascinated with the online furor around Kony and the world attention it has brought to Uganda. Mainly because I’m actually going to be in Kampala, Uganda in a month. With a team of pastors and leaders from Hamilton, I will be going to explore mutuality and partnership with the Ugandan church. I am excited about learning more about prayer, community and hospitality from those who practice it so well in the African context. And I and trust that as we share the stories of how God is working among us in Hamilton, that it will strengthen the hearts and ministries of our Ugandan brothers and sisters. Our departure date is coming quickly, and I’m in preparation mode. Today I get all my immunizations (yuk). Yellow fever. Hepatitis A & B. Get those Malaria pills! I’ve gone to Value Village and picked up some skirts to wear. Been to the library and gotten all kinds of Ugandan fiction to read, to help me get in the head space of those I’m going to be hanging out with. And am in last minute preparations for our big fundraising event for our trip. I’m actually going to be singing at the concert (gulp – as you all know, I’m very comfortable in a worship context – but concert! Eeek!). 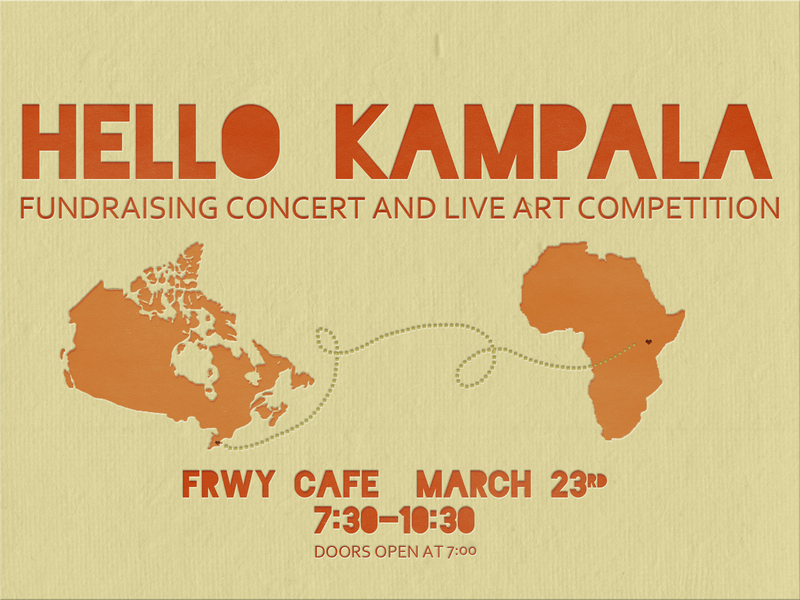 I really want to encourage you to come out next Friday, hear the bands, watch the Battle of the Brushes (live art competition), and hear more from our team about what we (and hopefully God) are up to in Uganda. Later this week, Kirk and I are going to be releasing our first full length album in 10 years! It’s called “We Wait”, and is a live recording of an experiment. What would happen if we put a bunch of God lovin’ and musically brilliant musicians and singers together, waitied on the Lord for an hour or so, and rolled the tapes while we did it? You’ll have to buy the CD to see…. It will be available in mp3 form later on this week. The cost? A donation towards my trip to Uganda. You can donate online here, and we will send you a link where you can download the album. We will also have hard copies available at the Hello Kampala event, for those who prefer an actual CD. We put a ton of canvas down on the floor in our prayer room last week, and supplied people with fabric markers to draw or write their prayers. So here is the end result!